At Firenze Number Nine, the entrance rooms are adorned in neutral colors and classic Florentine materials including stone and marble. They are juxtaposed with bright flowers, oversized chairs draped in deep purple velvet, and pops of orange as accent color. Via dei Conti is one of those dreamlike, narrow, gently curving streets in Florence’s Centro Storico. It is a compilation of outposts: a trattoria, a cafe, a warm and inviting new vegan-ish restaurant (they have vegan offerings but it is not exclusively vegan), a vintage store, and a bed and breakfast. If we did not arrive by taxi at the exact address, we would have walked right by the nearly secretive Firenze Number Nine, a luxury hotel that has thus far kept itself quite under the wraps. Even after the first day, I found myself walking right by it. Swing open the wide glass door, step into the chic entrance room of the restored 17th century palace, and find yourself in the capable hands of Simone, an Yves Saint Laurent look-alike, complete with subdued manner, elegant eyewear, and a calming voice. The buzzy Centro Storico lay waiting for you on the other side of the glass, but for now, take a moment to re-center yourself inside this oasis in the heart of a sometimes frenzied city. The entrance room at Firenze Number Nine. The staff are young, attentive, and excellently trained for their posts in luxury service. They speak in relaxed tones, they anticipate your every question and request, and due to the small and manageable size of the hotel, they give you their undivided attention. The mood is relaxed, however, and the hotel is set up so that guests feel as though they are at home with an added bonus of fantastic service. There is no stately check-in desk; it is a more casual interaction and process, a concept which has become more the norm in luxury hotels. I dare not even use the word ‘lobby,’ which feels so old-fashioned and formal. Each time we returned to the property, we felt as though we were entering our own living room filled with friends and family. Studio Pieratteli Architecture designed the hotel in 2012 with their signature focus on materials, shapes, transparency, and lightness, which altogether create a feeling of floating in space. 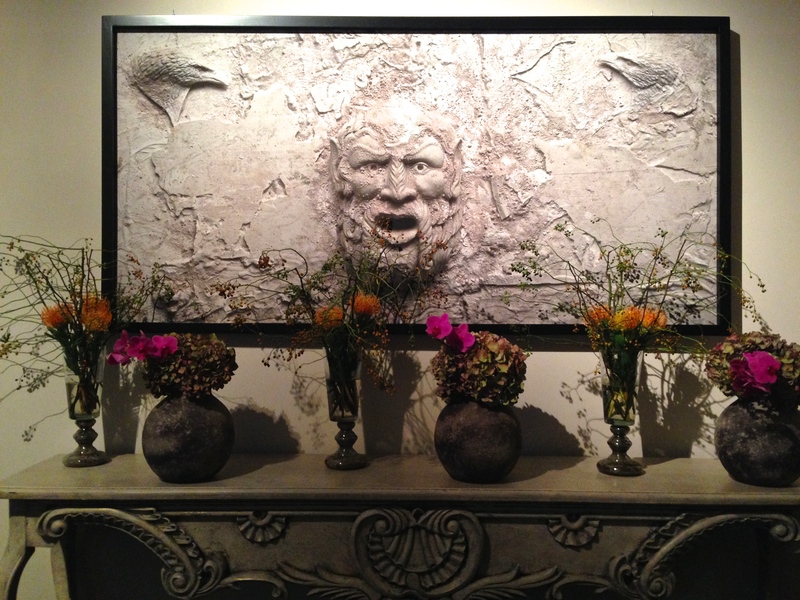 The decor juxtaposes elements of the renaissance with the uber contemporary and modern. 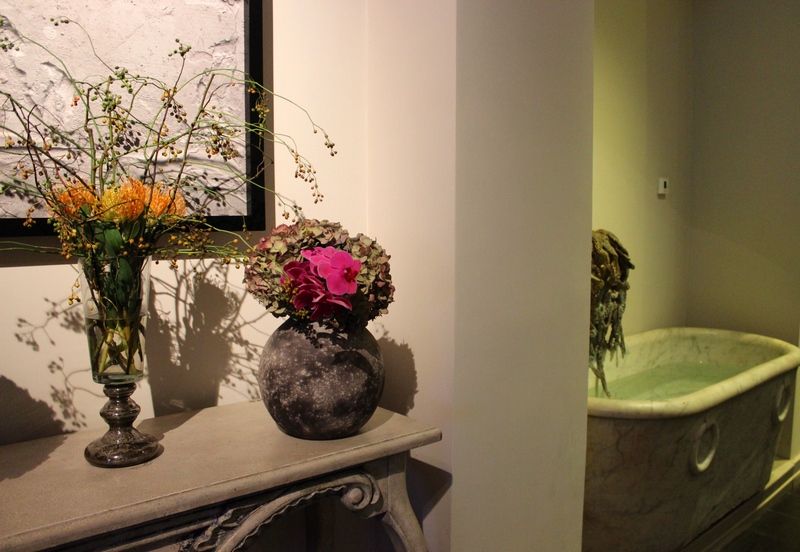 The entrance rooms are adorned in neutral colors and classic Florentine materials including stone and marble. They are harmonized with bright flowers, accented with pops of orange, and furnished with comfortable seating draped in deep purple and cream velvet. Just off of the main entrance room is a quieter sitting room designed for comfort; a plump sofa and oversized velvet chairs surround a low cocktail table scattered with beautifully bound books. Floor to ceiling shelves offer guests reading material sorted by category: viaggia, l’arte, etc. It is the perfect room to decompress after hours on one’s feet or while waiting for a companion to come down from their room. 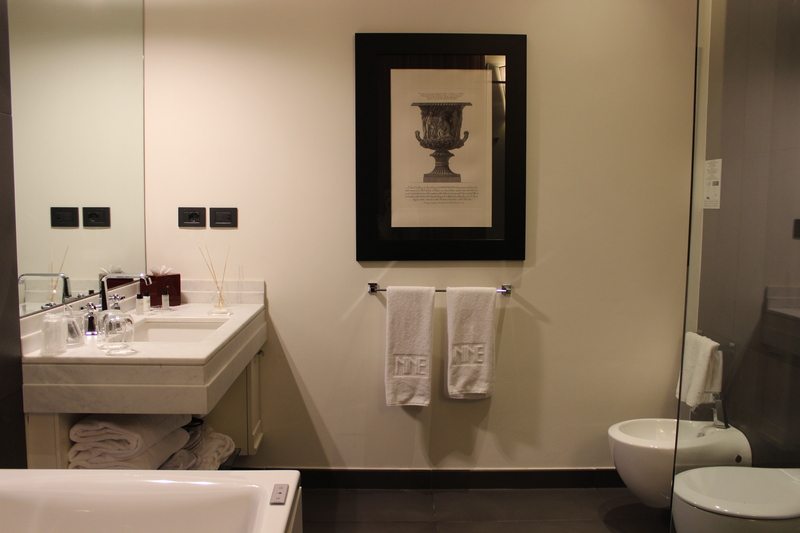 The immaculate guest rooms are the most modern areas. Purple remains the constant key accent color, with the rest of the room decorated in fresh, clean white. 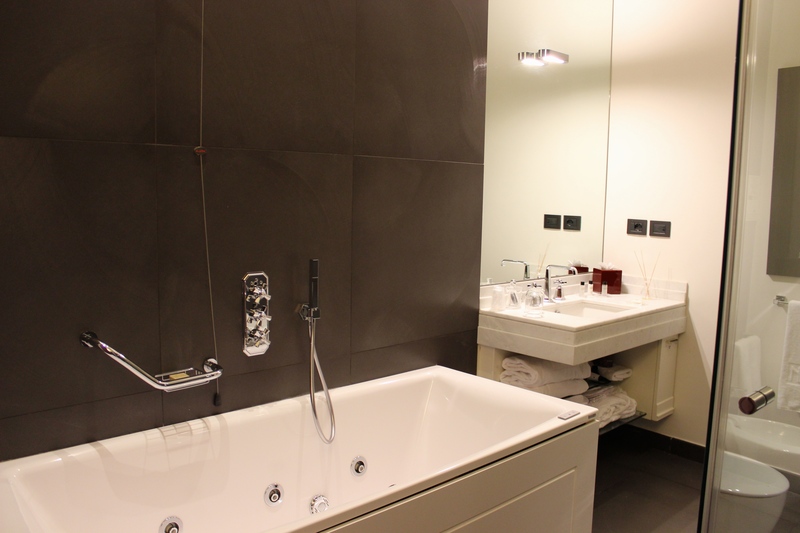 The bathrooms are a composition of dark gray tiles and white marble. Perhaps the intention was to offer the guest the most modern experience possible in terms of lighting and electricity, but I was confounded by the amount of power switches, and each time we entered the room and turned on one switch, every possible power outlet in the room flipped on as well, including the televisions. The bathroom proved equally complicated; although the bathtub in our first room (we were upgraded on our second night), was oversized and looked incredibly sumptuous and extremely tempting, we could not for the life of us figure out how to turn on the main faucet without soaking ourselves with the handheld shower. I found the bathrooms in our second room to be more smartly designed. On the second night, we asked for a room with two separate beds, and without even requesting it, we were delightfully upgraded to the penthouse suite. Now we not only had our own beds, we each had our own floor. 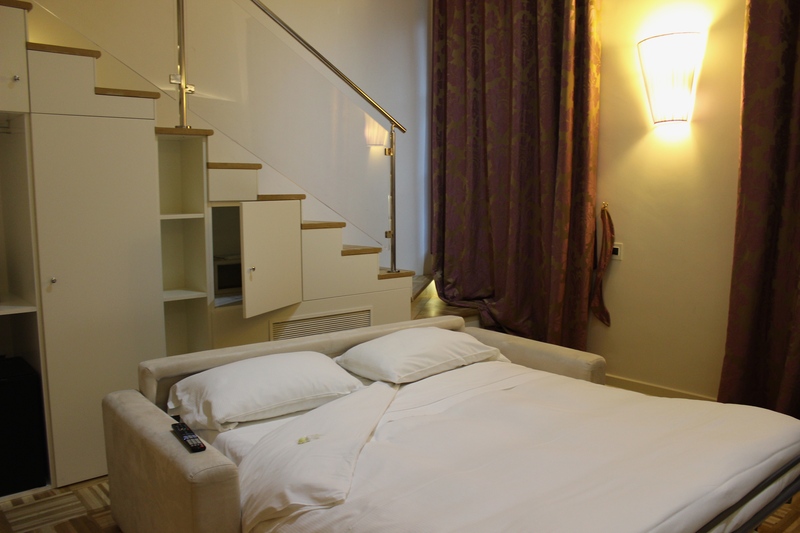 Upstairs, the master bedroom was a spacious loft with a king size bed and an oversized bathroom to match. We quickly discovered that having separate bathrooms is truly the key to a successful vacation, (at the very least, separate sinks.) I was glad that I had a handful of my own bath products, because although the service proved endlessly giving, the hotel lacked the usual array of complimentary toiletries. 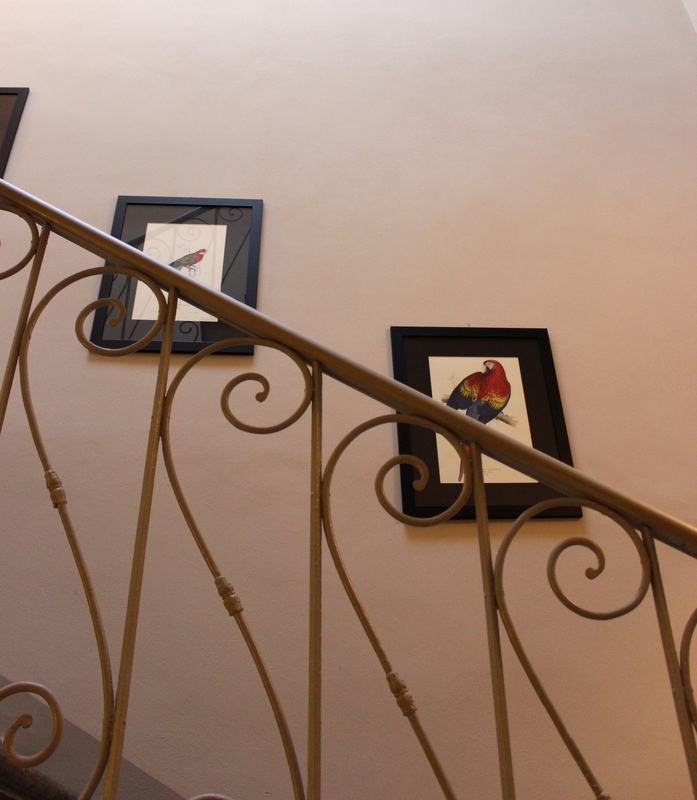 While the elevators are spacious for European city hotels, the wide stone staircase is far more interesting to ascend and descend, as it is lined with beautiful sketches of colorful birds; each an original print. The breakfast room was perhaps the most closed off, although it adjoins a small inner courtyard; it felt a tad stuffier than the rest of the airy building. The breakfast was a typical Tuscan hotel spread with far more carbs, cakes, and cheeses than fresh fruit, but the cappuccino was outstanding; the best I had during the whole trip. 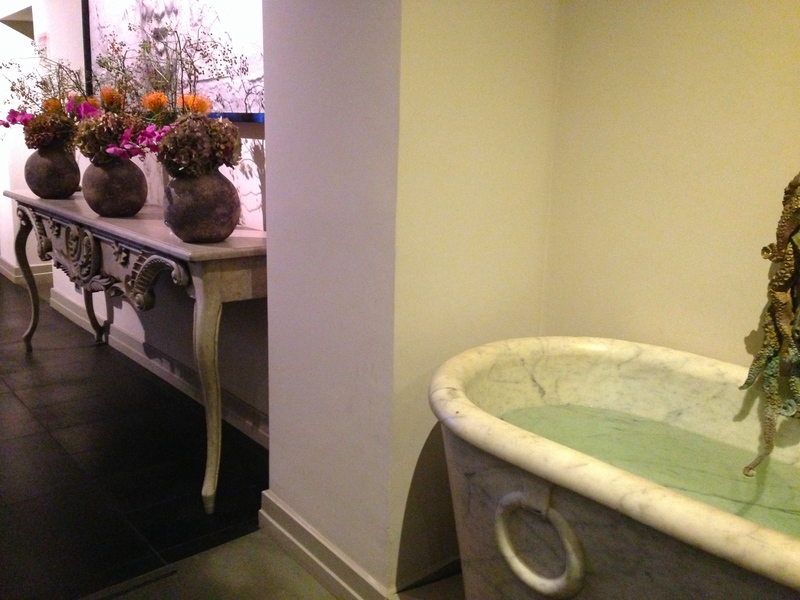 Downstairs, guests can take advantage of Firenze Number Nine’s urban spa and fitness center, so fantastic that one of the receptionists at Belmond Villa San Michele later asked us if we had discovered it. The exclusive wellness spa is complete with a sauna, a bio sauna, turkish bath, and whirlpool, perfect for rejuvenating weary feet and muscles after a day of wandering in the center. 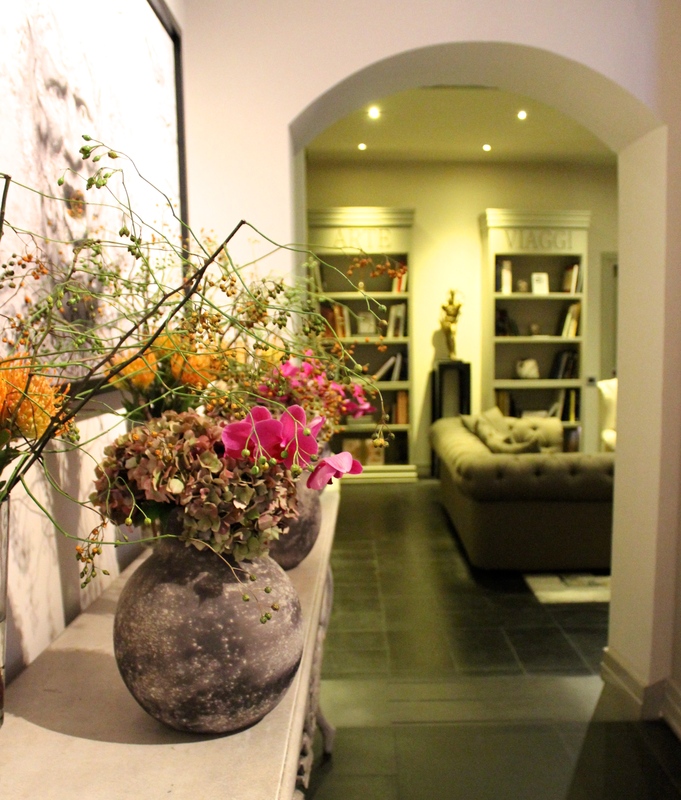 It is my humble prediction that luxury travelers will soon discover Firenze Number Nine’s sleek, homey atmosphere, its ideal location, (blocks from Florence’s principal shopping areas and a ten minute stroll to the Arno), and it will become one of the most sought-after hotels in the Centro Storico. When next you find yourself at this piccolo gem, say ciao to Simone, Lapo, and Yanni.